For a loooong time (at least for me ) it was a fact that files have to be in a database. 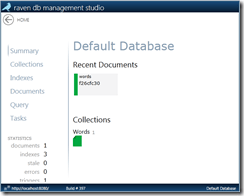 Usual files are saved in a relational database and linked. But in a while there exists resistance – NoSQL is the word. There are several types of NoSQL database – for a first view I recommend you the Wikipedia article. Prominent representatives are MongoDB and CouchDB. RavenDB is a quite young representative of the document database. The Quellcode is Open Source but you need a Closed-Source application licence. The developer is Ayende Rahien which Blog works with RavenDB as data source as well. The main different to the other NoSQL databases is the well done integration into Windows & .NET platforms. 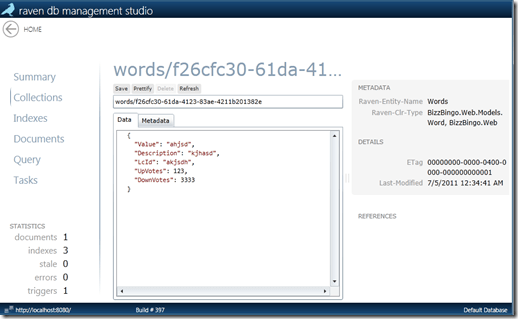 Different to an SQL database schema less JSON document will be saved in RavenDB. It’s also possible to apply LINQ based Indexes. The documentation is also quite good for a first entry. At least first-time user should read “Document Structure Design Considerations”. 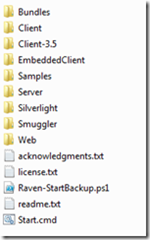 RavenDB could be downloaded at the Download-side. In this package are several Samples, the RavenDB server and various Client-libraries included. The most interesting folder is the “Server” folder and (at least for the introduction) the folder “Samples”. The easiest way is the console application. After the start of the server should the management interface open in the browser. 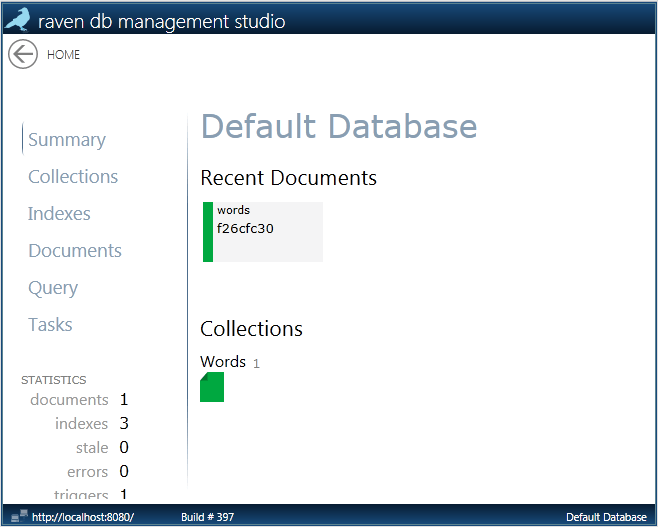 The RavenDB management studio is in Silverlight and it looks quite nice. In this management interface it’s possible to take a look at the documents and edit them. I think it’s related to the SQL management studio. You can get the assemblies from the download folder or you get the NuGet package. After we’ve talked about the concepts and the server works we are now going to talk about the Coding. Some Code-parts are from the Blogsystem of Ayende – named Raccoon. I’ve taken some Infrastructure-code from the Raccoon project. This code makes it easier to get access to the RavenDB and it’s easy to call from every Controller. /// This filter will manage the session for all of the controllers that needs a Raven Document Session. /// because this is the sole case where we actually need to do injection. I’ve chosen a very simple model without any connections to other objects. This will follow later on. That’s it about the introduction to RavenDB. This is just a small infrastructure that makes it easy to get in touch with RavenDB. You will find the whole Source Code on Codeplex in BusinessBingo Repository. Of course I recommend you the blog of Ayende – there are some posts of RavenDB. Also there are some RavenDB tutorials. And if that’s not enough take a look on the page of Rob Ashton.